A versatile multilayer-based polarimeter with five high precision rotation axes allows the analysis of polarization of the photon beam at the beamline. It is based on rotating both the transmission (acts as polarizer) and the reflection multilayers (acts as analyzer) around the photon beam. 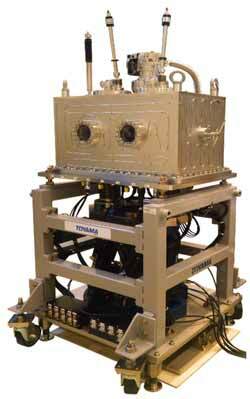 The polarimeter is designed to cover a wide energy range from EUV to soft x-ray for the MAX IV laboratory. Its hexapod support with jacking castors gives a high accuracy, automated alignment and allows it to be easily transferred between different beamlines. W. Grizolli, J. Laksman, F. Hennies, B. N. Jensen, R. Nyholm, and R. Sankari: 'Multilayer based soft-x-ray polarimeter at MAX IV Laboratory', Rev. Sci. Instrum., 87, 025102 (2016).